It's 1980 in a small town somewhere in West Germany. Summer vacation has just started and the days seem long for Tobias (12), a raving Beatles-fan. He is dreaming about having a band of his own together with his older brother Till. But Till just started dating his first girl-friend and therefore has other things on his mind. One fine day a mysterious man appears in town driving a white VW beetle, apparently English, with steering wheel on the right hand side. 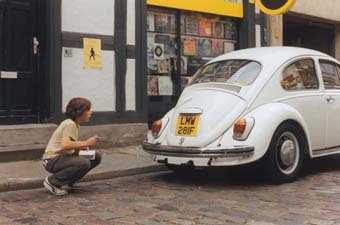 Tobias is convinced that he has seen the licence plate on the car before. Going through his LPs he finds his suspicions confirmed: It is the beetle shown on the Abbey Road cover. His detective instincts aroused, he discovers a strange story which happened in 1966: Paul McCartney died under mysterious circumstances and was replaced with a double by his manager, Brian Epstein. All the elements seem to match and Tobias starts to investigate the case, believing he is confronted with Paul McCartney's killer. Hendrik Handloegten was born in 1968 and studied at the German Academy of Film & Television (dffb) in Berlin. His graduation film, Paul is Dead, went on to win numerous awards including the prestigious Adolph-Grimme Award in 2001, as well as earning him an invitation to the highly renowned Slamdance Festival that same year. In 1999, together with Achim von Borries, Handloegten also worked on the screenplay with Bernd Lichtenberg and Wolfgang Becker for Becker’s global success Good Bye, Lenin!. Learning to Lie was adapted to the big screen by Handloegten from Frank Goosen’s best-selling novel Liegen Lernen.